I just pretended it was a fashion statement. a little bit of pizazz to brighten me up. Kind of like when girls add glitter to their hair. the pergola is pretty much done. It moved over to the patio off of our master bedroom for a couple different reasons. The patio is a little larger and we were able to attach it to the house for more stability. Plus, we have something else planned for the other patio area. We decided on 3 columns instead of just 2 at the far end. and it creates a more substantial, elegant feel. the ladder and couldn't get the ladder down. and found it to be intact. A few bent leaves here and there, but that was all. on the upper patios it did not seem too short. days during spring break - they did a fantastic job. we just needed a few new boards for the added length and width. I used metal conduit and clips and simple tulle drapes. but next week, I will be sharing the finished patio. I was so happy to put away my paint brush and start cleaning up! The boys sure did a fantastic job! 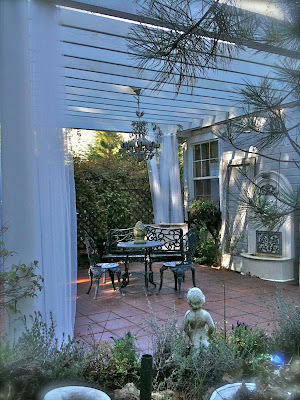 I love your pergola and your patio, beautiful! Love your patio, great job! Is this one guaranteed not to fall down? Love the new pergola. I know what you mean about that primer sticking to skin. I had it all over me when I was painting recently...you just have to wait for it to wear off. I thought...wow..it really does stick better than paint because the paint came right off of me. Also when I went to distress my furniture...I had a hard time getting through the primer to the wood. Hope this means my paint job will last forever. I love your new pergola and can't wait to see how you style it. I'm sure it will be fantastic. So happy that your chandi survived! This is so fabulous! Love the ladder accessory! I cannot imagine the fun of decorating this! 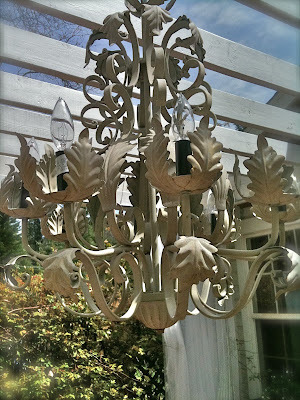 love your courtyard, pergola and chandelier!! What a beautiful pergola. I bet after you are done decorating, it's going to be spectacular. Keep us posted! It is beautiful. We have a pergola above our deck and I just love the look. I had to blow up the picture with the ladder and show him, that is something we would have done too. I am curious what kind of drapes you used and how you hung them. I have simple half sheets hanging by staples until I figure out what I really want. Oh how very lovely. 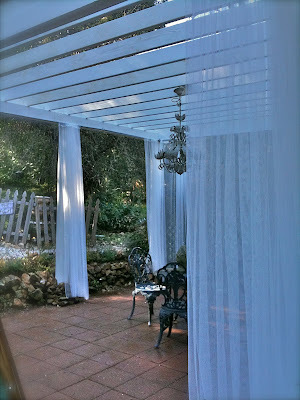 I just love the sheers you have used in the pergola and have never seen them used outdoors before. Do they weather well outdoors like that? I'm about to hang some in my screen porch to help block the sun a bit without blocking the view completely. Just need to figure out what & where to buy and how to hang them that's all. Oh how gorgeous Courtney!! That ladder is a hoot though!! Yes I have paint strands in my hair too!! This is truly a romantic patio!! Your pergola is Amazing! Oh My Gosh! I was so sad for you when it blew down, and now it's wonderful again! The ladder photo is so funny, that made me laugh out loud. And, i can totally relate to having primer on my skin, that stuff has to just wear off. I've gotten paint on everything, including my dogs! What an enchanting area!! Beautiful. Mmmmmm, I am in love! 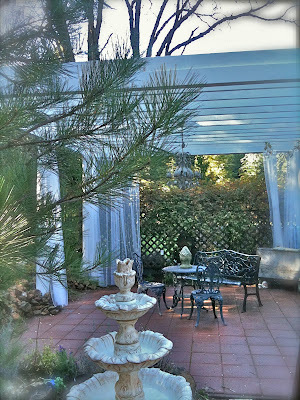 Love the pergola-- you have a lovely patio area. That ladder picture is a HOOT! Courtney, I love the new pergola! That was a ton of work getting it all painted. Well almost all painted! How did you end up getting that ladder off? That was so funny. Not so much at the time I'm sure. It just looks so great! Courtney, what a beautiful patio to enjoy. Love the pergola. You have been busy. That is funny about the ladder. Thanks for joining the party! I had to look again when you said you had some decorating to do. It's so beautiful as is! So so funny about the area you missed, and the ladder! Hahaha! My kind of story! So glad it's back up for you! That is gorgeous! What fun you will have decorating it. So pretty! You are going to make that space amazing. Can't wait to see. Oh my friend I hear ya on the paint. I went to a meeting and then was going to a movie afterwards so I scrubbed and scrubbed to get the paint off (oil is almost impossible) and felt so proud of myself only to look down at my ankle in the meeting and see paint all up my ankle and leg..sigh. I am in LOVE with your pergola. Would you ever be able to share the directions on how you made it? I want one so bad for my deck. Oh I'm showing a little peek at my open cabinets tonight on I.F. with a shout out to my oh so clever friend Courtney on the arched openings..stay tuned. ;) Have a beautiful day! Oh, wow! This is in my dreams! I love that you put a chandelier there, too. And a fountain! If I was there, I would never leave that area! Oh this is so lovely! You will spend so much time there. That chandelier is gorgeous!! What a great job y'all did! 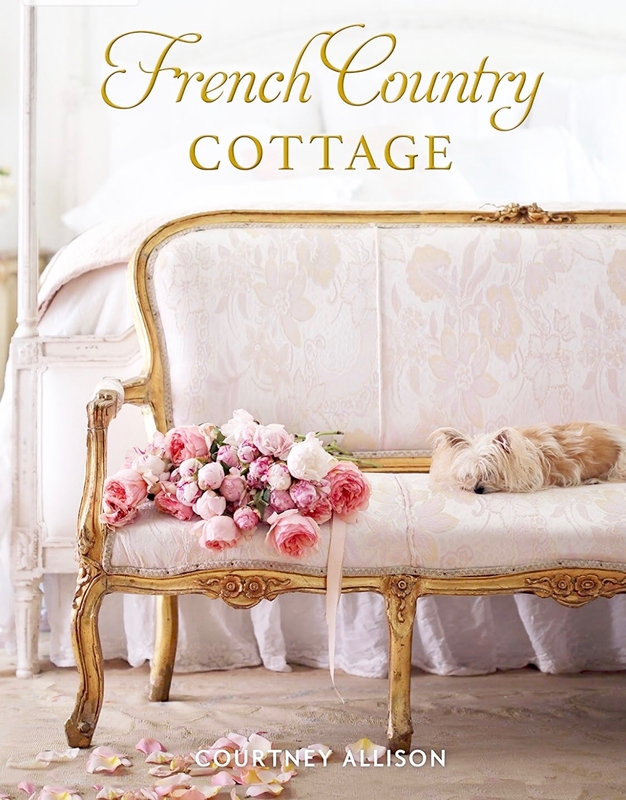 Thanks for stopping by THe Ivy Cottage and commenting on my painted hutch! 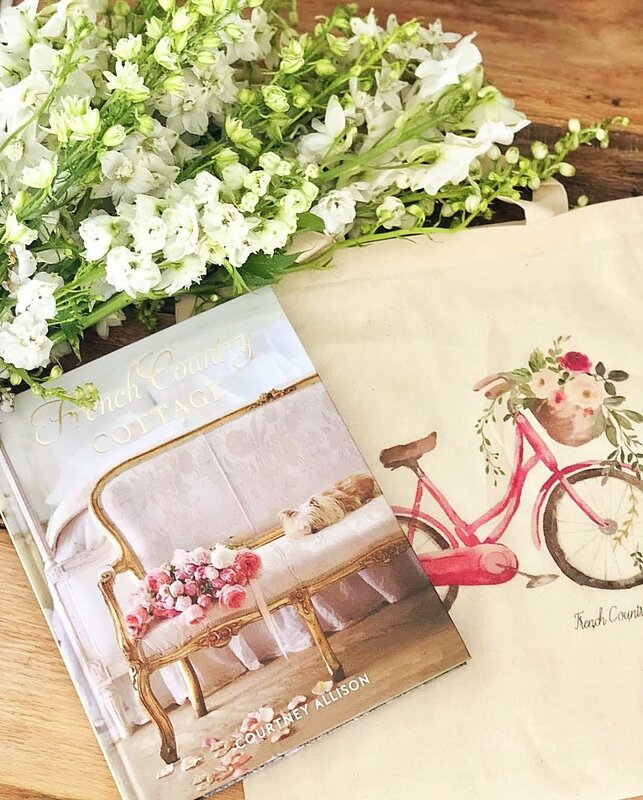 Love your blog and am now following! 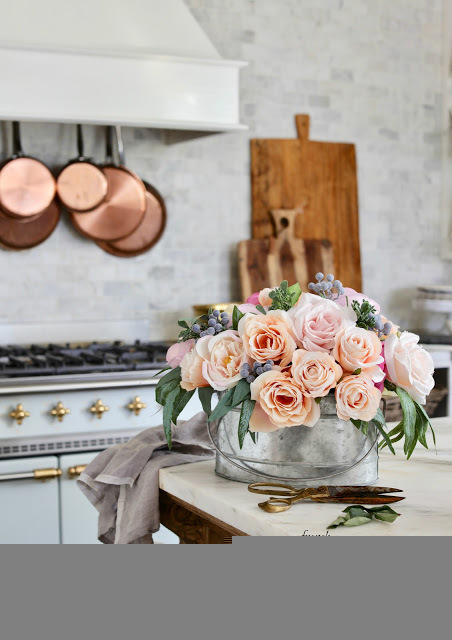 Hope to be back here for your friday link up! Primer be damned it looks GREAT! I hope you leave the ladder that is just perfect. Can't wait to see when it is all done although I don't know how you can improve on what you already have. Hi Courtney, Your pergola is beautiful! The drapes and fountain look wonderful and I know it will be even more beautiful when you finish decorating. I would have just left the ladder, painted it and added potted plants to the steps. lol! Thanks for sharing this at my party. Haha! There is always something we miss!!! 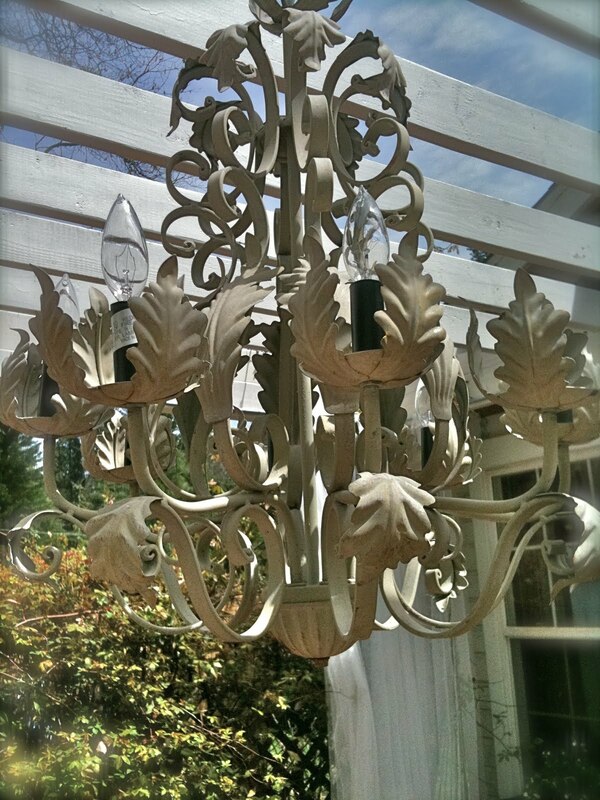 I have been there with you on the paint/primer in the hair...Your pergola looks fantastic and I love the chandi out there! Your patio is looking gorgeous Courtney, and I can't wait to see what you do to the other one! That is such a beautiful space! I know I would love a beautiful place like that to "retreat" Fabulous! Wonderful! I can only imagine all the work a cleaning up it took to do by a wonderful mother and a young girl who thinks Charlie is Awesome!! HaHaaaaaaaaaa!a! Shun the nonbeliever! Shunnnnnnnnnna! 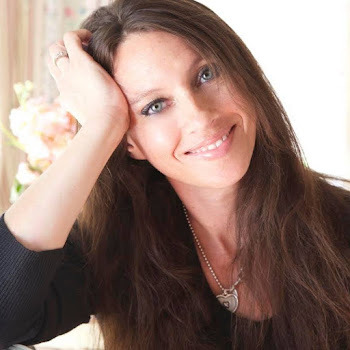 :) Love your blog mom, Love you! :) ! That is absolutely beautiful Courtney! It will be a amazing entertaining space. Thanks for linking it up! This is just gorgeous! I see many days and nights spent out here! I'll be featuring it on Tuesday! Your pergola is gorgeous! Someday I want to put one over our back deck. I love your primer in the hair story, Courtney. My husband saw some oil based paint in mine and thought I missed a spot coloring!! I was not horrified that I had paint in my hair(that wouldn't come out for weeks) but that gray might be showing. I love your pergola!! 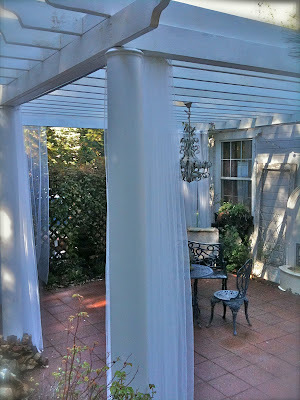 Oh my goodness, I have NEVER wanted a pergola with curtains and a chandelier more than after seeing your gorgeous project! This gets 5 stars in my book. Well done! As for primer in the hair...been there!